I'm trying not to panic. Why? 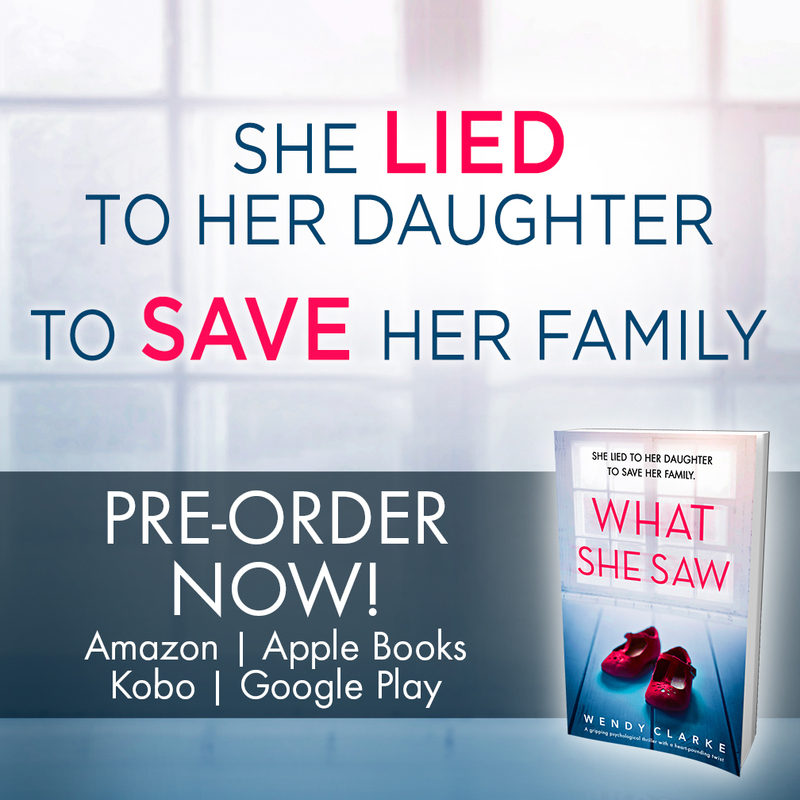 Because in three week's time, my debut psychological thriller, What She Saw will be published. I've been waiting for this for a long time but now that it's getting closer I'm starting to get nervous. What if people don't like my book? What if no one buys it? Silly thoughts, I know, as my editor is really pleased with how the pre-orders of the ebook are going and already I've had a favorable response to it on Goodreads, but I just can't help it. The problem is, as an author, it doesn't matter how many lovely 4 and 5 star reviews you have, it will always be the others you focus on. That's human nature I suppose. I was given the advice not to look at my reviews... but it's hard not to. 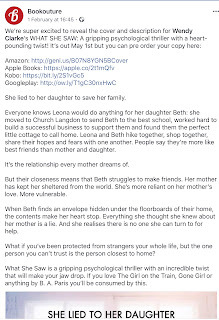 Also, if I hadn't looked, I'd have missed out on the reviewer who said my characters were 'meh' but also missed out on the one who said, 'I've read many thrillers but this one blew them all out of the water'. The whole process is nerve-wracking but exciting too. There have been three other exciting things that have happened this week. The first is that I've seen the paperback version of my novel is now available to pre-order. Yippee! 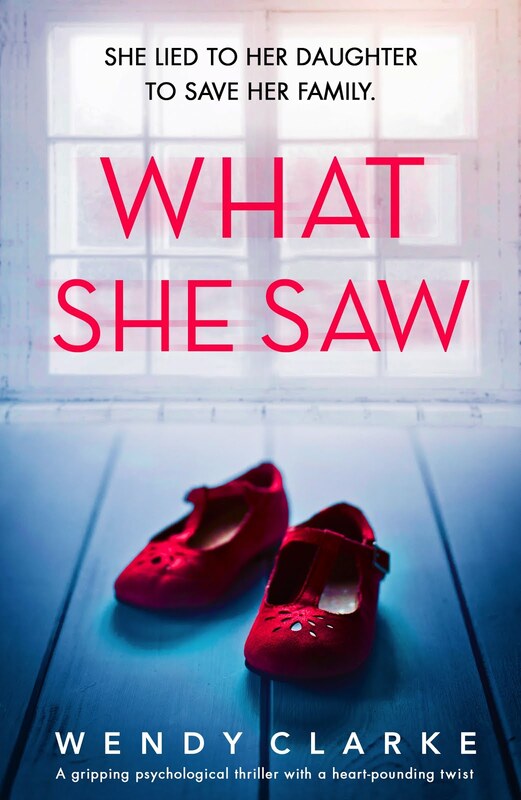 The second is I've spoken to the owner of my lovely local independent bookshop (Steyning Bookshop) and she's happy to stock my novel on publication (I'm hoping that anyone who lives locally and wants to buy a paperback copy will support this wonderful shop). Finally, I've been told that the London studio has been booked for the audio of What She Saw. I've listened to a clip of the narrator on Audible and I'm delighted with my publisher's choice. I can't wait to hear it! Everything's happening so fast that it's no wonder my stomach is doing somersaults. What She Saw can be pre-ordered here for just 99p! 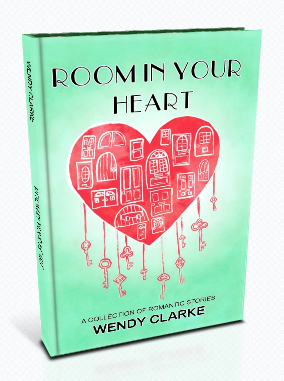 There are some blog guests I am always very happy to welcome back to Wendy's Writing Now and Merryn Allingham is one of them. She is here today to answer questions about her new release, A Tale of Two Sisters which is published by Canelo. Can you tell my readers a little more about A Tale of Two Sisters? It’s 1907 and Lydia Verinder has been in Constantinople for well over a year, working as a governess at Topkapi Palace. When Lydia’s letters home come to an abrupt halt, Alice Verinder is ready to blame her headstrong sister for thoughtlessness - Lydia has always been indulged and Alice’s feelings for her sister are decidedly mixed. 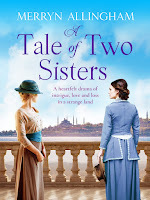 She loves Lydia and admires her courage and passion, but feels resentful that since her sister was bundled out of England to escape punishment for a suffragette ‘crime’, she is the one left caring for their parents. But Lydia’s continued silence is desperately worrying. Why should an English governess working in a securely guarded palace disappear without a word? Fearful of what might have happened, Alice sets out for Turkey alone, lying to her family about her destination. When she reaches Topkapi, she is overwhelmed by it magnificence and by the secrets she suspects the palace is hiding. Slowly she uncovers the fate of her sister, helped by a young Englishman she meets on the journey. At first, their relationship is prickly, but love grows as together they face the dangers her search provokes. Step by step, Alice penetrates the silence that reigns within the palace but is drawn into a perilous game of power and violence. What’s the hardest part of writing a novel set in a different century? I enjoy research which is probably why I’ve gravitated towards historical fiction. Most of my novels are set between the mid-Victorian era and World War Two, and the amount of source material available - letters, diaries, speeches, endless scholarly tomes and novels and films of the period - makes the task relatively easy as well as enjoyable. The internet, too, can be invaluable for checking those tiny details you didn’t know you didn’t know. Where it gets harder is when you’re writing of another country’s past - particularly when you don’t read the language - and you’re forced to lean heavily on other people’s interpretations of events. In the case of this novel, most accounts that I read of Turkish history and specifically the Ottoman Empire, were written by Europeans with an inevitable bias. How much research do you do before you start the novel? 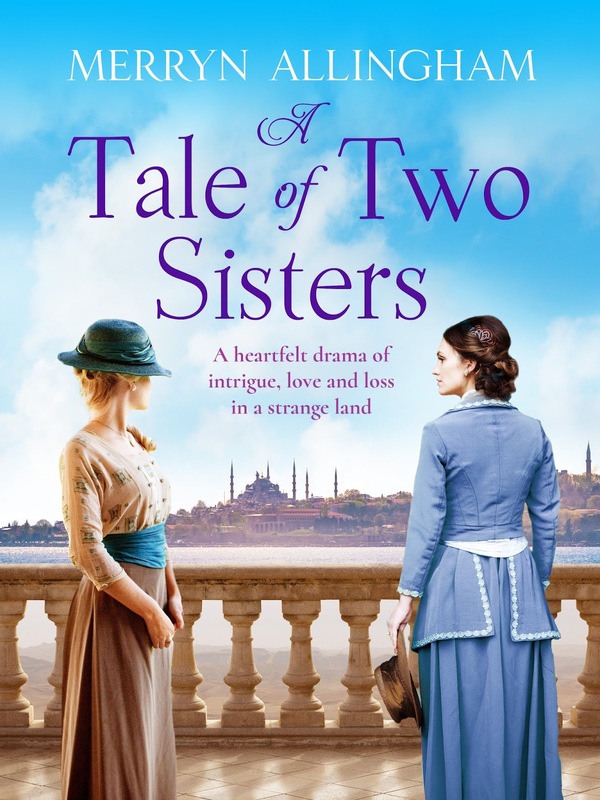 It varies, but in the case of A Tale of Two Sisters, I read a good deal about the Ottoman Empire in the early years of the twentieth century. It was a time of political upheaval with calls for democracy and lots of different groups vying to overthrow the Sultan. I also read about the empire itself - its history over four hundred years and the way in which Topkapi Palace or indeed any of the Ottoman palaces were organised according to a strictly observed hierarchy. There are several articles on my website - www.merrynallingham.com - that look at the role of women within the empire and the way in which the system of slavery worked. You might be quite surprised! You are with a new publisher. 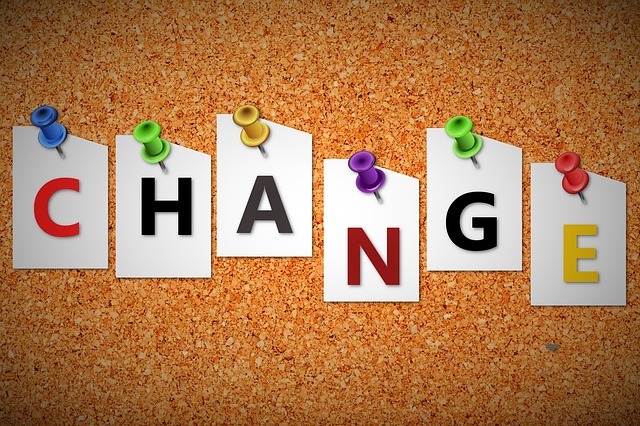 How have you found the transition? I moved from a large conglomerate publisher to Canelo, a smaller independent firm but one that is growing fast. I’ve found everyone approachable and very friendly. In terms of book production, the editorial advice, copy editing, the jacket cover, have all been excellent. So I’m a happy bunny! What is the central theme of your novel? The novel is a mystery and a romance, but at a deeper level it raises questions of identity, of the complexity of family relationships, and the triumph of love against the odds. Do you have a special time of day when you write? I tend to do ‘stuff’ in the morning - exercise classes, Italian lessons, meeting friends - so my writing time doesn’t usually start until after lunch. Then I’ll work until six or seven in the evening. I seem to need those morning hours for my brain to get into gear. Give us an insight into your main character. What is it about them that would make a reader want to go on the journey with them? In fact, I have two main characters, since the story is told from both sisters’ perspectives. On the surface, Alice is the quintessential daughter of the Edwardian era. She has dutifully run the Verinder household for years and, after her brother’s death and her sister’s escape to Turkey, is left alone to care for ailing parents. 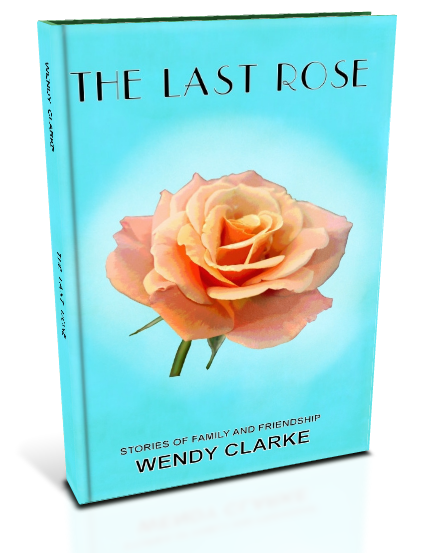 Over the years, she has lost sight of the person she used to be, and it takes a desperate situation to help her recover the ‘real’ Alice. 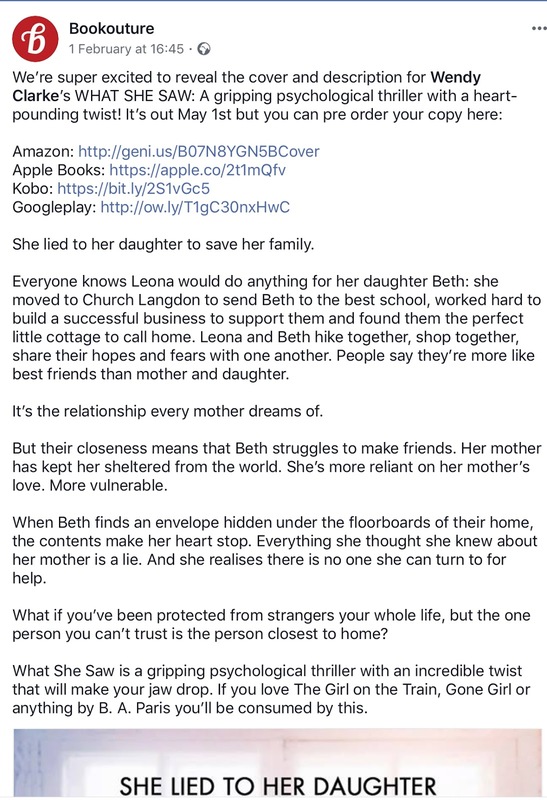 For Lydia, too, it’s the threat she faces that makes her realise for the first time how dear her family is to her. Each sister is forced to confront difficult feelings and face catastrophic loss. But both come to know reconciliation and the power of love. Lots do, but if I had to choose only one it would be Kate Atkinson. I love her style, the way she blends the literary and the popular. She’s also a writer willing to take chances and try different genres. Her first novel won the Orange Prize and a few years later the Jackson Brodie crime series was filmed for prime time television - you can’t get more versatile than that! Have you any desire to write in a different genre? I’ve wanted to write crime for a long time. I started out writing pure romance, but saw each book getting darker than the one before, and once I moved into mainstream women’s fiction, there was always a dead body somewhere in the story. But I was told quite firmly by those in the know that the odd body doesn’t make for crime. So this year I’m taking the plunge and publishing my first real crime novel - and with more than one body! In July, The Venice Atonement hits the shelves. It’s the first of a crime series set in different locations around the world, some of them definitely exotic. The books feature the same trio of characters - and the development of their relationship is probably as important as the crimes they solve. At the moment, I’m having fun writing number two in the series which is set on a fictional island in the Caribbean. I wonder, what could possibly go wrong? Merryn still loves to travel and visit new places, especially those with an interesting history, but the arrival of marriage, children and cats meant a more settled life in the south of England, where she has lived ever since. It also gave her the opportunity to go back to 'school' and eventually teach at university. She has written seven historical novels, all mysteries with a helping of suspense and a dash of romance - sometimes set in exotic locations and often against a background of stirring world events. 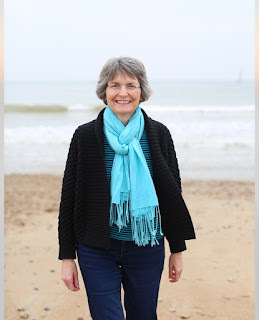 This week, I'm delighted to welcome back to Wendy's Writing Now good friend and talented author, Liz Eeles. Not only do we share the same publisher but Liz lives in the next town from me which is lovely. 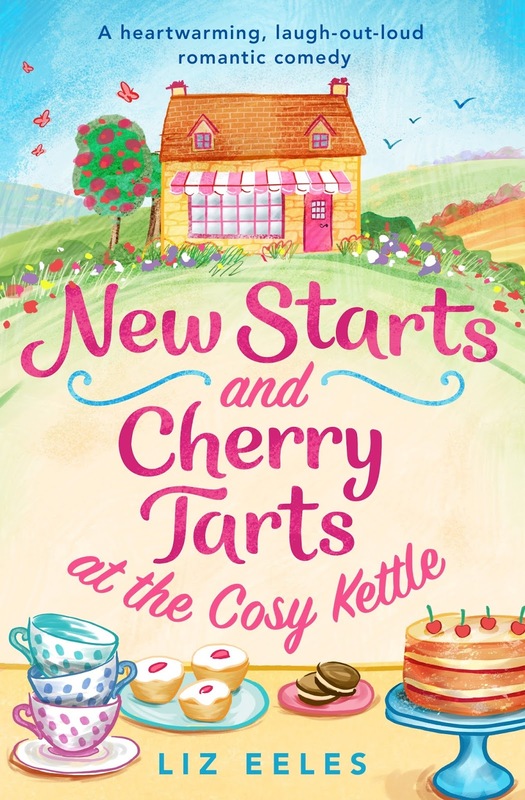 The first in Liz's new romantic comedy series, New Starts and Cherry Tarts at the Cosy Kettle, was published this week by Bookouture. Publication week is always a busy time for authors but Liz kindly spared me a few minutes to answer a few questions. Hopefully her answers will whet your appetite for her new novel. 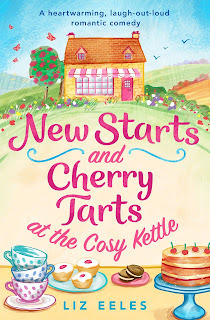 Can you remember where you were and what you were doing when the idea for New Starts and Cherry Tarts at The Cosy Kettle first came to you? Not really – which isn’t a great start on question 1! I wanted to write about the beautiful Cotswolds, where I grew up, and knew the book would have a romance at its heart. But the rest – the bookshop, the café, and how my main character, Callie, grows in confidence and stops being such a people-pleaser – came to me gradually. What three words would you use to describe your novel? I wrote a pretty rough first draft in about four months and spent another month re-writing it, before it was in a fit state to start going through the edits process. Having a deadline really helps me to sit down, stop faffing about and get on with it. That’s hard for me to judge because my first three published books are also a series, set in Cornwall – though all three can be read as standalones. Writing a series is probably easier in some ways because your characters and setting are already established by the time you get to books 2 and 3. And it’s great to have the space to develop characters and stay with them for longer. But it can be tricky if you resolve a character’s problems in book 1 and then have to come up with more problems for them in book 2 or 3. I always feel a bit mean putting them through another trauma! Definitely Stanley, Callie’s granddad. He’s just had his eightieth birthday and has decided to become his ‘true self’ before it’s too late. This involves saying what he thinks, taking on challenges from wild swimming to parachute jumps, and becoming an eco-warrior. He was great fun to write and I’m delighted when readers say how much they love him. Not really, though Josh, the handsome hero in my first Cornwall trilogy, ended up looking rather like Richard Armitage in the TV series North and South, which was absolutely fine by me. Getting away from my computer and out into the open air helps to blow away the cobwebs. I live on the south coast, so I walk a lot by the sea with friends and enjoy having a good natter. And I love watching telly and can often be found binge-watching box sets. They’re all very supportive, especially my husband who always reads an early draft of my books - I’ve introduced him to the genre of romcom. He’s also very long-suffering as publication day approaches and my anxiety levels start rising! Don’t listen to that little voice in your head which says: You’re really rubbish at this writing lark, you’re wasting your time and will never get anywhere. I’ve realised that published authors – even those who sell loads of books – can suffer from anxiety about whether they’re good enough. So, keep going and seek informed and constructive feedback on your work, rather than listen to your inner critic. What next for Liz Eeles? More Cosy Kettle books! 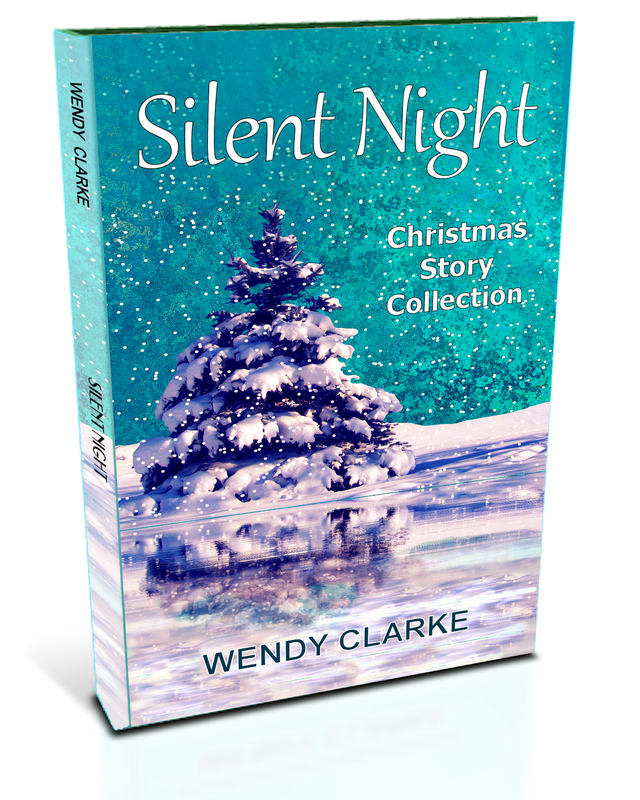 I’m editing the second book in the series at the moment, and the third and final book - which will be a Christmas story - is all mapped out. Now all I have to do is write it! Liz Eeles writes funny, feel-good romantic comedies set in the Cotswolds and Cornwall. She was brought up in Gloucestershire so the Cotswolds are 'home', and she fell in love with Cornwall during family holidays there as a child. 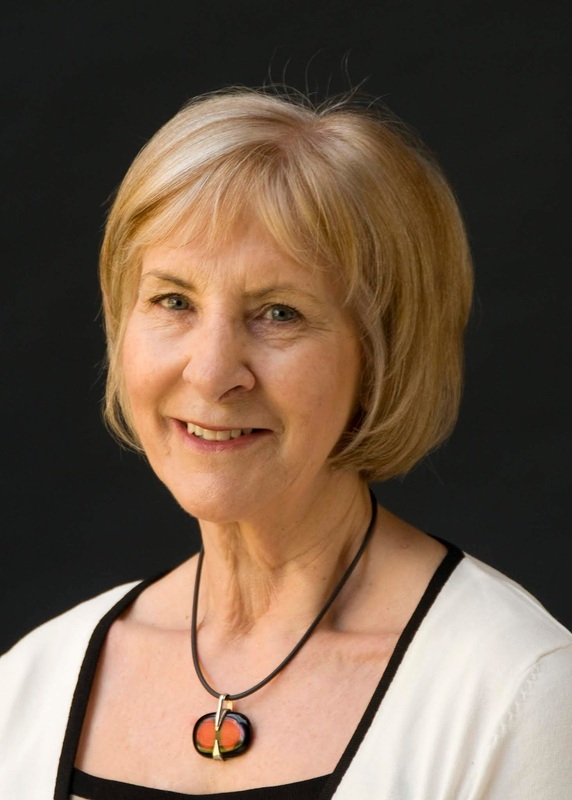 Liz worked as a journalist for years and brought up a family on the south coast, all the while writing fiction on the quiet. 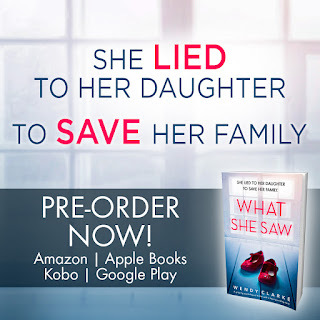 After being short-listed in a couple of national novel-writing competitions, her dream of being a published author came true when she was signed by Bookouture. Today, I watched a group of school children and their parents pass my window on their way to school. Nothing unusual in that, you might think - the half term holidays are, after all, at an end. On any other day, I wouldn't give them a second thought but today... well, today is a milestone. Eight years ago, to the day, I watched a similar group of children walking to school. That day would be the first time in years I would not be getting into my car and driving to my own small primary school to start my day as an English teacher. You see three days earlier, I'd been given the devastating news the school would be closing and we were all to be made redundant. People often talk about the pivotal moments in their lives and this was mine. My life, as I knew it, was about to change, but I had no way of knowing then how much. I could have stayed in education but (even though I'd been happy at my school) I'd never felt teaching was what I really should be doing. It wasn't a career I chose carefully, rather I fell into it. My mum and sister were both teachers and, in all honesty, I just hadn't come up with a better plan. It was my chance to try something new... but what? By chance, my brother had just completed an online creative writing course. He'd enjoyed it and thought I might too. Why didn't I give it a go? I did. I loved it. Then I did a second. A little voice in my head said, this is something you're not bad at. Why not give it a go? At first my ambitions were small. I wanted to have a story published in a magazine. But when, to my delight, I did, I wasn't satisfied. I'd got the bug. I wanted more. I began to take my writing more seriously. I had more stories published. I had serials published. I wrote a novel... then two more. What had started as a hobby was becoming something else. Without me realising it, I had a new career. Today, after the schoolchildren had gone past my window, I thought about whether I had any regrets. Whether I missed those days in the classroom. I realised I hadn't missed them at all. Not once in the eight years. And that's because I've been doing something I love. As May, when the first of my novels will be published, creeps closer, and my excitement mounts, I know that sometimes adversity can bring its own rewards. Misfortune can have a silver lining. I might complain about the edits, the deadlines, the mind-numbing dullness of reading your manuscript for what feels like the zillionth time, but I wouldn't change it for the world. I've just looked at the title of this post and I feel rather satisfied with the alliteration which was totally unintentional. It's nice when things just work for you... unlike second novels. Yes, this post is all about the dreaded 'second novel syndrome'. Those of you who are writers and have written more than one book will know what I'm talking about and, even if you haven't experienced it yourself, you will probably have heard of someone who has. As experiences go, it really isn't that great. So what is second novel syndrome? Well, it's exactly what it says on the tin. 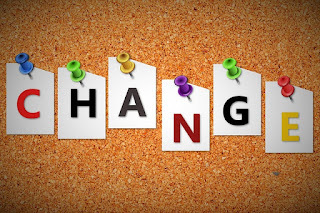 It's the problem that arises when you've written a novel you're happy with and then have to do the same thing again... just as well or even better. Let me set the scene. 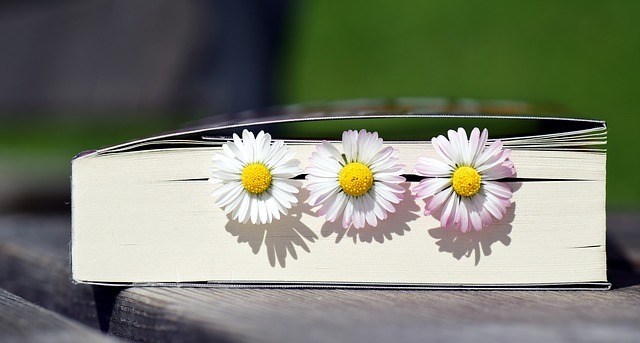 You've spent months or years writing your first novel, have had it read by beta readers, have maybe had a critique (such as the one you get if you're on the RNA NWS), you've fiddled and changed and fussed and made it as perfectly perfect as it can possibly be. What you've had is TIME. Time to let the idea brew, time to write, time to get it just as you want it. While you've been writing, you've had no one breathing down your neck, no deadlines (unless you've made your own - and these can be broken without penalty), no one 'waiting' for your next book with expectations. You've been able to write when you like and, if you've not felt like it, could leave your computer and do something else. Basically, you've been your own master. Then something wonderful happens. You manage to find yourself an agent, or, as I did, approach some publishers yourself. You're offered a two-book, or maybe even a three-book, deal (is there such a thing as third book syndrome?) and even as you're popping open the champagne, you know that, already, things have changed. At last you're going to be a published author but you will no longer be travelling this path alone. Joining you will be your agent (if you have one), your editor and, eventually, your readers. Your first novel has been accepted but now your editor is asking you what you have in mind for the second one. Could you write an outline? A synopsis? Inside your head you're screaming, but I haven't had time to think up something as good as novel one. I need years. Hard luck - you'll have to think of something fast! So you delve into the farthest reaches of your imagination and, amazingly, manage to dredge up an idea you think might work. You get something down on paper and, to your surprise, your editor likes it. So far so good. The problem is, this time you don't have years to write the thing. Depending on your publisher, you might get only a few months AND it will have to be written at the same time you're working on the edits, publication and marketing of book one. Not only this, but all the time you're writing your second novel, you are doing it under the weight of expectation. If this one's not as good as the first, there will be a lot of people you'll be letting down... your agent, your editor and, most importantly, your readers. This is where the doubt kicks in and the niggling voice in your head becomes more insistent. Am I just a one-trick pony? Do I only have the one good book in me? Do I deserve to be writing this second novel? Would I be better off sweeping chimneys? And the suffering hasn't finished yet. While you're writing your second novel, the characters from your first will still be with you as you edit and proofread their story. As you try to cast an entirely new set of characters for novel two, they'll be whispering in your ear, these people are boring. Who would want to spend time with them when they're not as engaging as us? The doubt becomes stronger. You lose your powers of objectivity. Around thirty thousand words, you think that every sentence you write sounds trite and the nearer to the end you get, the more you feel like an impostor. That's where I was last week as I wrote THE END to novel two whilst in the thick of edits for novel one. 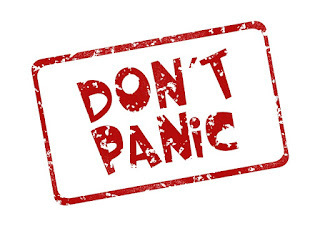 As I pressed 'send' and waited for my editor to read it, I have to admit to being scared (even though she is lovely). What if she hated it? Thankfully, I didn't have to wait too long. Withing a few days, my editor came back to me. She didn't hate it... or tear up my contract! In fact, although we'll need to do some work on it, she said it was a very strong second novel with a twist that was even better than the first. I could have cried with relief. The moral of this story: I experienced second novel syndrome and I survived. And, if I can, so can you! Happy New Year to you all, and I wish every one of you good health and happiness for 2019. Last week, best writing buddy Tracy Fells and I met up in our favourite cafe, armed with our target notebooks, for teacakes and a spot of yearly goal setting. We've been doing this for six years now - six years! I can hardly believe it. In my last post, I looked at whether I had achieved my 2018 goals. You can read it here. But this post isn't about looking back, it's about looking forward and, if I'm honest, the 2019 goals have been harder to set than previous years. Why? Because where my writing goes this year will depend on how well the two books that will be published in May and August do. If I'm lucky, I might be offered another contract with my lovely publisher, Bookouture. If not... well, I'll just have to cross that bridge if and when I come to it. There are a lot of things that I will be doing this year now I'm under contract: completing the publication process for book one then starting and completing the editing and publication process for book two. After that, there will be the publicity and the marketing to think about... not to mention the celebrating! But, these are not exactly goals. They're things that have to be done as the wheels of the publishing machine turn. It would be cheating to put 'to have two books published' as my goal for 2019! Instead, I need to think about where I want to go after that and what new things I'd like to have achieved by the end of the year. To enjoy every minute of being a published novelist . To secure another publishing deal (this one is out of my hands). To think about and start novel 3 (which is actually novel 4 as my first novel is still awaiting a publisher). If I can achieve all these things in 2019, I shall be a very happy writer indeed. What about you? Do you have yearly writing goals? If so, do feel free to share yours in the comments and I wish you the very best of luck with them.